Earthbound Misfits is a whimsical look at the misplaced values of a floundering generation. Edward O’Leary is a middle-aged divorcee stuck in a mediocre job. His inability to live up to his deceased father’s expectations has crippled his maturation. Originally from affluence, the family fortune as since dwindled, forcing Edward to make a living as a carpenter. It’s an honest job offering modest wages. Whatever supplemental income Edward can scrimp and save goes to pay child support to his two children and alimony to his spiteful ex-wife. Edward grew up in an opulent neighborhood in New York. His father’s ex business partner, Remy McAllister (a corrupt lawyer) and his family, still live across the street from Edward’s former residence. To this day, his best friends remain Pat Keenan and the three McAllister brothers still living at the same address. Into their late thirties and early forties, suffering from Peter Pan Syndrome, the McAllister brothers never grew up. Remy’s wife, Tatiana, an established lawyer in her own right, did the best she could raising the three rug rats, but perhaps she pampered them too much. She is a quirky, frail chain-smoker who, wears a black trench coat while outdoors. Her appearance resembles a witch. Ralph “Roofie” McAllister is the oldest of the McAllister children. A forty-two year old, 6’4” drug-dealer, he supplements his income by selling marijuana to the locals. This massive, hairy human is a cross between a grizzly bear and a sumo wrestler. The middle child, Dexter McAllister, is one chromosome short of a full deck. He’s portly and balding. This martial arts and weight-lifting enthusiast spends most of his time watching the popular Spanish channel, Telemundo, with his Rottweiler, Princess and Pong, a Vietnamese exchange student visiting the McAllister’s for the summer. Dexter’s girlfriend, Mary, works as a stripper at a gentleman’s club. The baby of the Family, Charlie McAlister, is tall, lanky and clumsy. This amateur daredevil thinks he’s from the hood and speaks in a slang dialect. He spends most of his days organizing Motocross jousting competitions that take place in the McAllister’s back yard. Charlie has trouble with authority figures, has many run-ins with the law, and it’s his father’s law connections that keep him out of prison. Eventually, the McAllister family fortune is squandered, causing the splintered family to fend for themselves. Tatiana tries to keep the family unit together, but it’s difficult after she catches her husband in an extra-marital affair and her marriage to Remy collapses. The three boys are ill-equipped to make it in the real world. Roofie, in desperation, falsely confesses to a brutal crime that extradites him to a foreign country. While in Norway, the eldest McAllister takes full advantage of the amenities offered by the country’s lenient penal system. His prison is more like a four-star hotel than a correctional facility. Edward, being the perpetual Samaritan, flies to Norway in a vain attempt to save Roofie, but is friend beyond redemption? Told strictly from Ed’s point of view, he shares his adventures experienced with the McAllister brothers. Scott Leddy is the author of four novels and two short stories including bestselling novel ‘Beyond Gehenna.’ A longtime resident of New York, Scott currently lives in Connecticut with his wife and son. Scott Leddy can be reached by email at scott.leddy@yahoo.com. 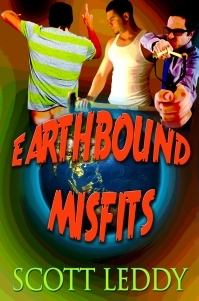 The paperback and e-book version of ‘Earthbound Misfits’ is available at Amazon. More information is available at scottleddy.net.